A2600 Spider-Man (USA) in 03:04.04 by Mothrayas. 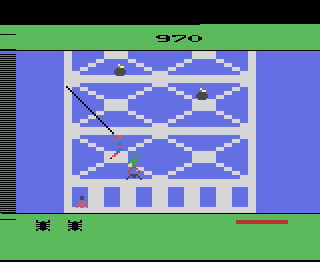 Spider-Man was the first game to feature the famous hero and also the first Marvel Comics-based video game. Here, Spider-Man must use his web shooters to scale a building and defuse bombs set atop it by the Green Goblin. Watch as Mothrayas climbs the colorful buildings with ease and saves the day in just over three minutes. Note: While this movie does obsolete one that's nine times shorter, that run only played through one level, while this one plays all six.